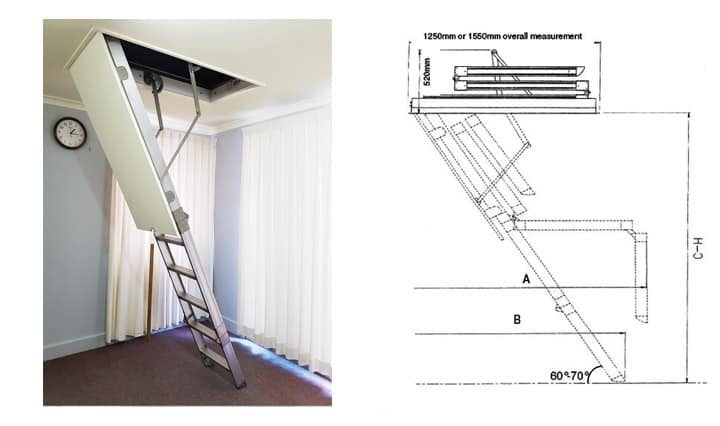 Accessible Attic Ladders proudly supply and install AM-BOSS Access Ladders which are made in Melbourne and cover a complete range of Access Ladders for residential and commercial. The Access Boss is made from strong aluminium and the treads are completely welded to the styles. It comes complete with a sturdy timber hatch frame and MDF hatch door. It also has a metal architrave neatly moulded and already fitted to the unit which saves you time when installing. The Access Boss uses heavy duty springs and a brilliant linkage arm system for easy flowing use when opening and closing. The Ladder is available in residential and commercial models and has a cut out opening width of 570mm with a 400mm wide tread. AM-BOSS also make a wider opening Ladder called the Big Boss and it has a 770mm cut out opening width and a 500mm wide tread. They are available in heights up to 4000mm. Heights over 4000mm on application. All AM-BOSS Folding Access Ladders comply to the BCA (Building Code of Australia and are CodeMark Certified) (License No: SAIG-CM 20058) as per there CodeMark Certificate of Conformity. The residential Ladders carry a 20 yr guarantee and all commercial ladders carry a 1 yr guarantee.